Our friends Ben and Teresa Carey have launched Morse Alpha, offering coastal and offshore sail training and leadership expeditions aboard their Norseman 447 Rocinante. Summer voyages depart from Rockland, ME and head downeast to explore the rugged coasts of Maine and Nova Scotia. These ideal training waters offer many challenges including thick fog, numerous ledges, dramatic weather patterns, fast-flowing currents, and large tidal ranges. Ben and Teresa are both USCG Licensed Captains and experienced educators who have sailed a combined 65,000 nautical miles on over 60 different vessels from 16 to 180 feet. “We’ve delivered boats to and from the Caribbean, been across the Atlantic, circumnavigated Newfoundland and lived aboard during chilly New England winters,” said Ben. 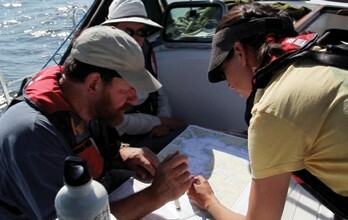 “We are committed to delivering a safe, fun, and educational expedition.” For more information, visit morsealpha.com.